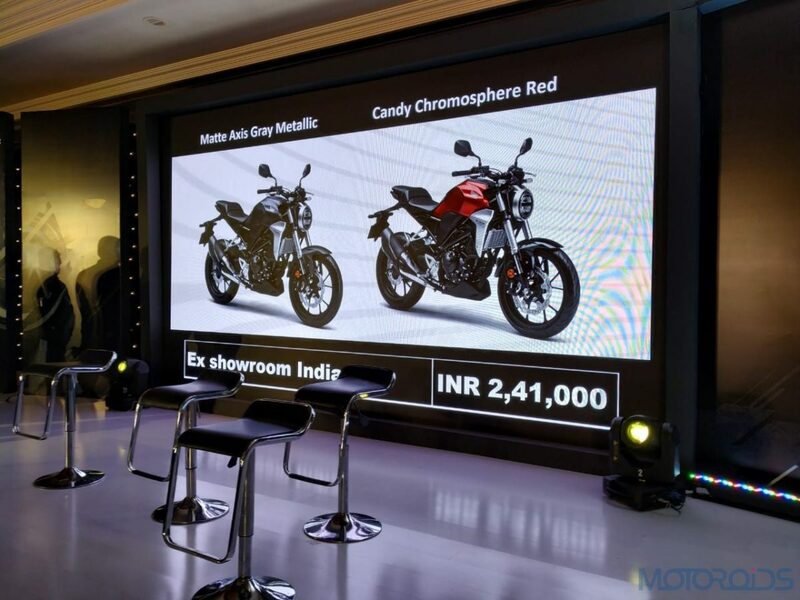 Honda today launched a surprise package in the Indian 2-wheeler market, the Honda CB 300R. Carrying Honda’s new Neo Sports Cafe design language, which has been borrowed from its elder sibling the CB 1000R, the CB 300R is one neat looking machine. Priced at INR 2.41 Lakh (Pan-India, Ex-showroom) the bike will be brought into the country through the CKD route. Here are 5 things you need to know about this newly launched bike. The term Neo Sports Café, may sound cool but also underlines the amalgamation of three different aspects which lead to this design style. The term Neo signifies the use of modern features like an all-digital instrument console, all-LED lighting and some more. The term Sport pays homage to the CB sporting lineage, offering an engaging riding experience. The term Café signifies the inspiration of the looks from the early café racers from the 1960s. 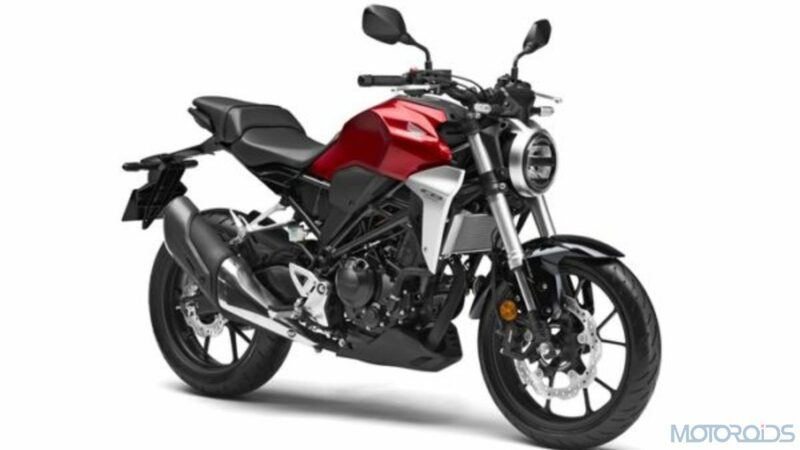 Powering the CB 300R is a 286cc, DOHC, liquid-cooled, single cylinder engine which cranks out 30.9 bhp @ 8,000 rpm, with peak torque of 27.5 Nm, delivered @ 6,500 rpm. The exhaust system has also been given a 2-room structure on the inside, which not only helps with acceleration but also provides an aggressive exhaust note. Tipping the scales at a mere 147 kilograms (wet), the CB 300R happens to be the most lightweight machine in its segment. Combine the low weight with a peak torque of 27.5 Nm, you get the best torque to weight ratio in the segment. This should translate into brisk acceleration and make the Honda CB300R one of the fastest bikes off the line. 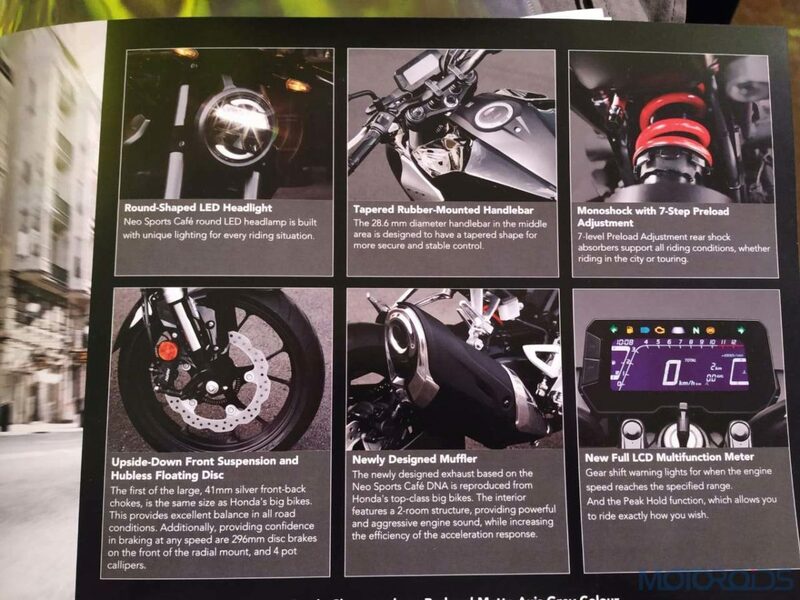 The motorcycle also gets an electronic display for instrumentation which features a shift light. The Honda’s display also gets a feature called ‘Peak Hold’, which we believe is the bike maker’s terminology for the shift indicator. The motorcycle features 41 mm USD front forks and a 7-step adjustable monoshock at the rear. 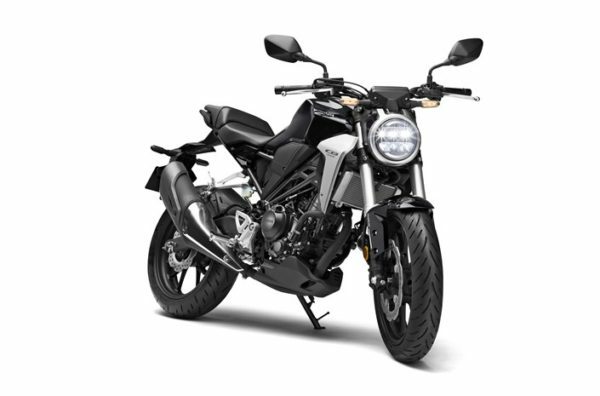 The CB 300R comes with disc brakes at both ends and going by the trend in the Indian market the CB 300R does indeed come with dual channel ABS. The front end also is offered with radially mounted callipers. That, however, was not enough for Honda and they also went ahead to offer an Inertial Measurement Unit, which helps with even distribution of the braking force in case of sudden braking. 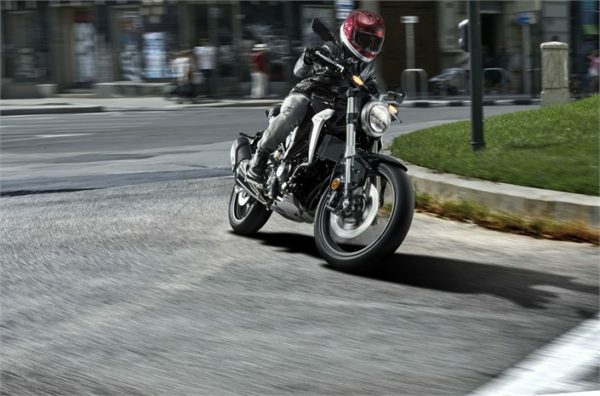 Aimed primarily towards first-time buyers, the Honda CB 300R promises to be low on maintenance. The engine is designed with a minimum number of moving parts, meaning less wear and tear and less amount spent on new parts. Moreover, components like low-friction piston rings, high-density core and radiator and the Iridium spark plug highly improve the fuel efficiency of the bike. Sold across a limited number of Wing World outlets across the country, Honda opened up the bookings of this vehicle in the month of January. 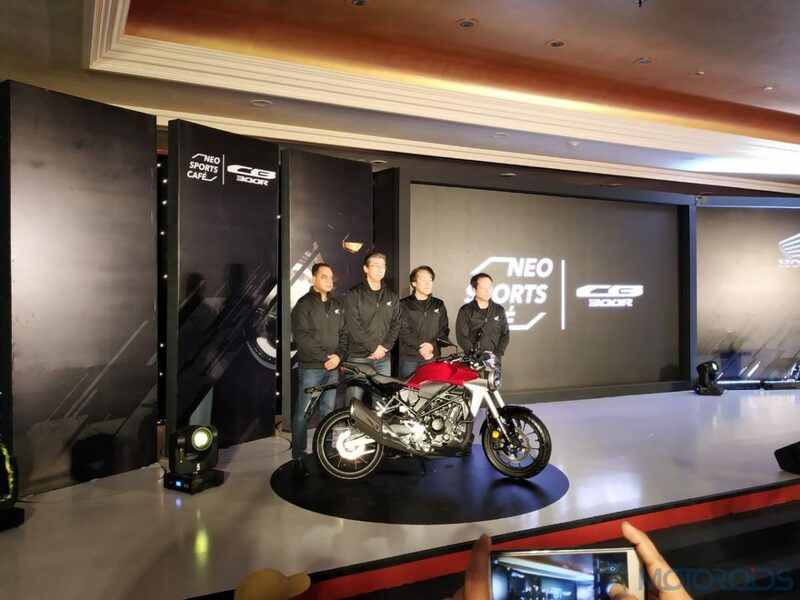 The company announced today, that the response of the vehicle has been immense and every bike made for the next three months is already sold. Offered in two attractive shades – Matte Axis Gray Metallic and Candy Chromosphere Red. Stay tuned for more updates on this brand new Honda.